Is or has economics ever been the imperial social science? Could or should it ever be so? These are the central concerns of this book. It involves a critical reflection on the process of how economics became the way it is, in terms of a narrow and intolerant orthodoxy, that has, nonetheless, increasingly directed its attention to appropriating the subject matter of other social sciences through the process termed "economics imperialism". 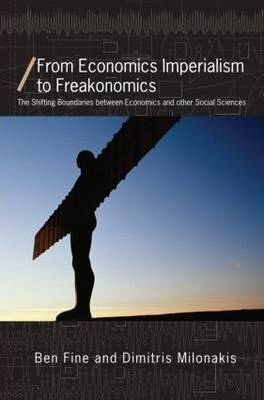 In other words, the book addresses the shifting boundaries between economics and the other social sciences as seen from the confines of the dismal science, with some reflection on the responses to the economic imperialists by other disciplines. Significantly, an old economics imperialism is identified of the "as if market" style most closely associated with Gary Becker, the public choice theory of Buchanan and Tullock and cliometrics. But this has given way to a more "revolutionary" form of economics imperialism associated with the information-theoretic economics of Akerlof and Stiglitz, and the new institutional economics of Coase, Wiliamson and North. Embracing one "new" field after another, economics imperialism reaches its most extreme version in the form of "freakonomics", the economic theory of everything on the basis of the most shallow principles. By way of contrast and as a guiding critical thread, a thorough review is offered of the appropriate principles underpinning political economy and its relationship to social science, and how these have been and continue to be deployed. The case is made for political economy with an interdisciplinary character, able to bridge the gap between economics and other social sciences, and draw upon and interrogate the nature of contemporary capitalism. 1. Introduction and Overview 2. The Historical Logic of Economics Imperialism 3. The Economic Approach: Marginalism Extended 4. New Economics Imperialism: The Revolution Portrayed 5. From Economics, through Institutions to Society? 6. From Social Capital to Freakonomics 7. Economics Confronts the Social Sciences: Resistance or Smooth Progression? 8. Whither Economics? 9. Whither Social Science? 10. Whither Political Economy? Ben Fine is Professor of Economics at the School of Oriental and African Studies, University of London. He is the author of Social Capital Versus Social Theory (2001), The World of Consumption (2002), the co-editor of Development Policy in the 21st Century (2001), and co-author of From Political Economy to Economics (2009) all published by Routledge. Dimitris Milonakis is Associate Professor and Head of the Economics Department at the University of Crete. He is the co-author of From Political Economy to Economics (2009) published by Routledge.